After the weather we've had, we're longing to see lush landscapes with a wild sort of beauty, outdoor spaces bursting with life, blooms and leaves in every shade of green. Following a long winter slumber, these buoyant gardens truly signal spring. While they may seem a bit unruly next to a manicured English garden, these layered, often rustic, landscapes are, in fact, carefully cultivated. 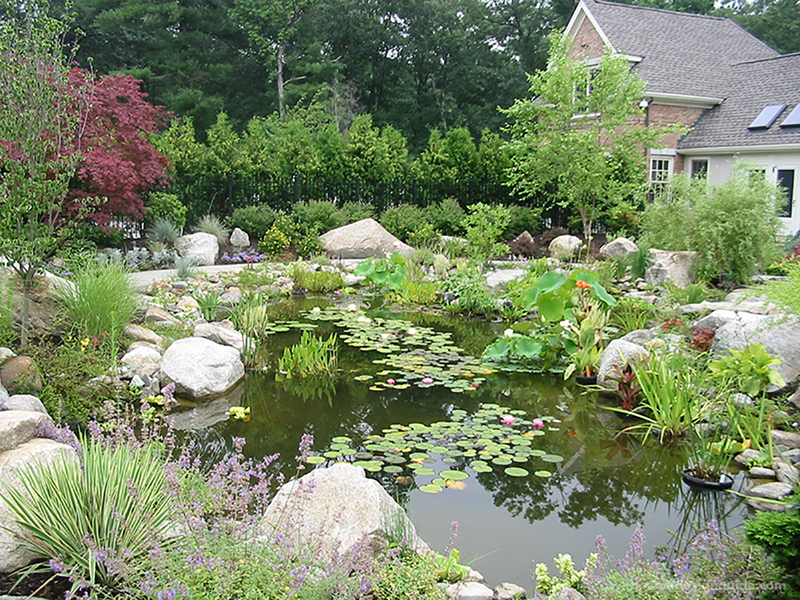 There is a method to the natural splendor created by leading Boston landscape architects and professionals. Have a look…. 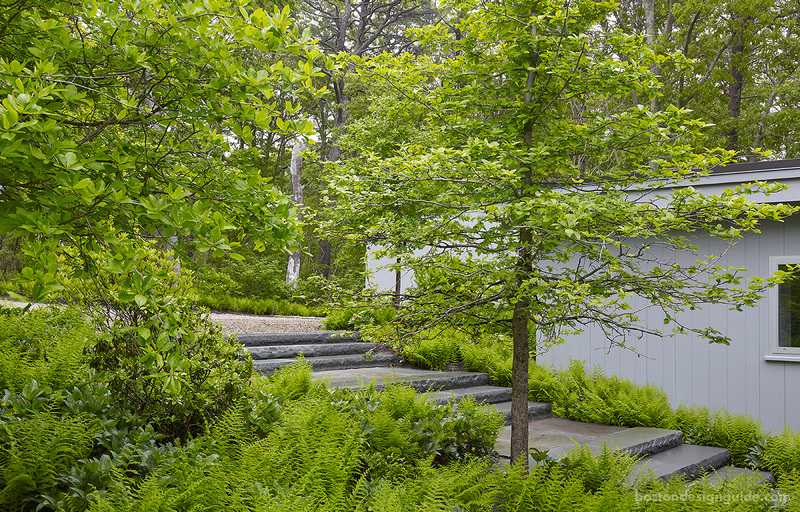 For a newly renovated midcentury modern summer home in Wellfleet, perched astride a kettle hole pond, LeBlanc Jones Landscape Architects looked to the lush terrain for its landscape cues. The firm reveled in the tree-house feel of the home and played up the thick, natural vegetation of the environs that makes the summer escape the retreat that it is. Teeming with hayscented ferns, hellebores, cranberry bush, viburnums and Tupelo trees, the site is what makes this home so spectacular. 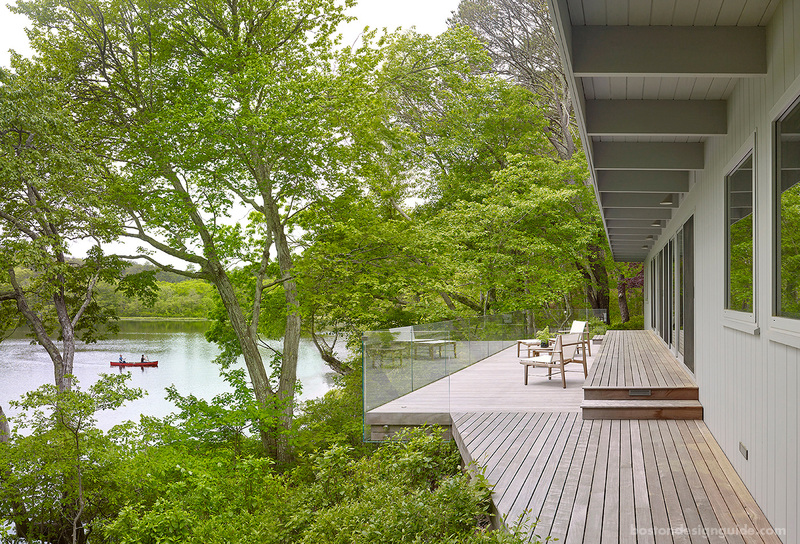 Yet it isn’t showy—rather, it’s vibrant and green and riddled with public and private spaces to soak it all in—including a sensational deck overhang perched among the trees. 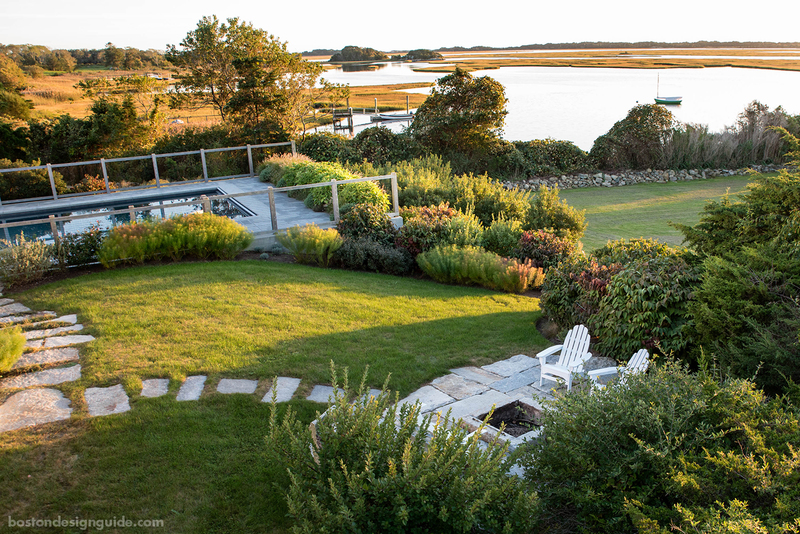 Located on the edge of the Westport River, this spectacular site conceived by Matthew Cunningham Landscape Design, was designed to frame its marsh views and present “spaces to casually observe wildlife patterns,” says Principal Matthew Cunningham. 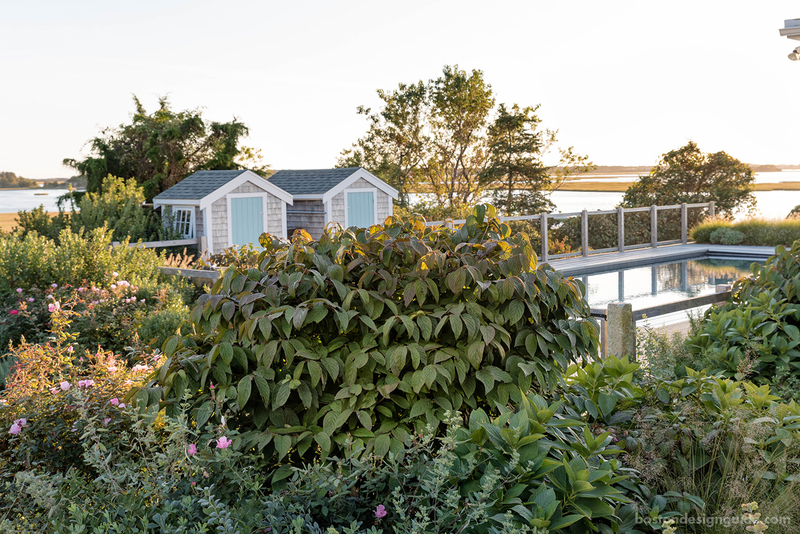 The terrain, which surrounds a quiet pool that’s as still as the river, is comprised almost entirely of hardy, drought-resistant native plants that can withstand intense salt, wind and sun exposure, explains Cunningham. The tangles of growth and color are glorious to look at, as well as a food source and habitat for local wildlife. 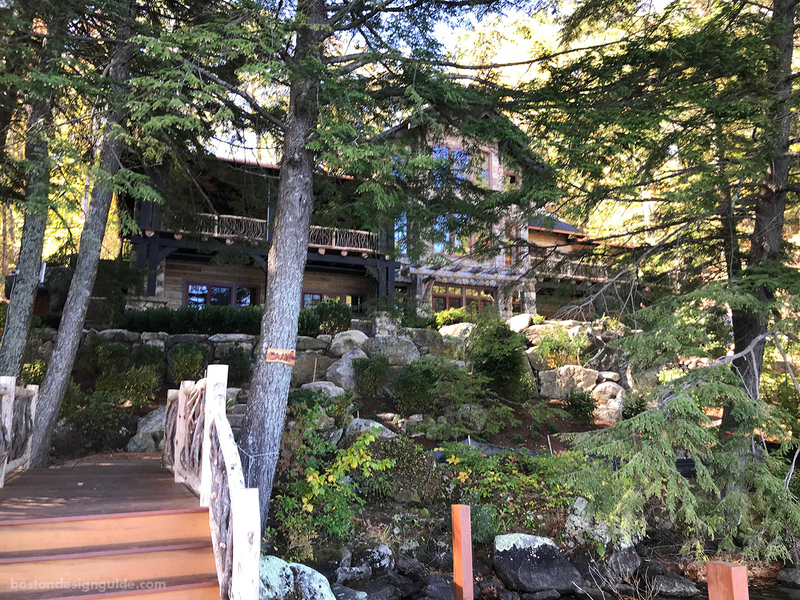 The landscape of a rustic American style custom home on Lake Sunapee took Sudbury Design Group to New Hampshire for a full site renovation. The clients’ goal was to make “the camp look like it had always been in the woods,” shares the landscape architecture firm, which, given the site’s topography, buffer zone restrictions and the desired program posed a challenge. Completed just last fall, the landscape project will fill in over time and is planted primarily in masses of native shrub and trees including varieties of viburnum, witchhazel, azalea, birch and hemlock. Low ferns and blueberry groundcovers grow between the woody plants, establishing the edging for soft, pine-needle woodland paths that grace the sloping grounds, while large specimen evergreens were brought in to add a sense of character. The terrain’s hardscape, which gives the site its rugged good looks, is as integral to the design as the softscape. The team carved out boulders to use as a coping for the spa, and utilized natural fieldstone (salvaged from the site and brought in) for the boulder walls and steps, and Pennsylvania fieldstone flats and reclaimed granite for the terraces. The inspired mix lends a sense of history and adds to the illusion that the homeowner has somehow stumbled upon this unspoiled lakeside vantage. 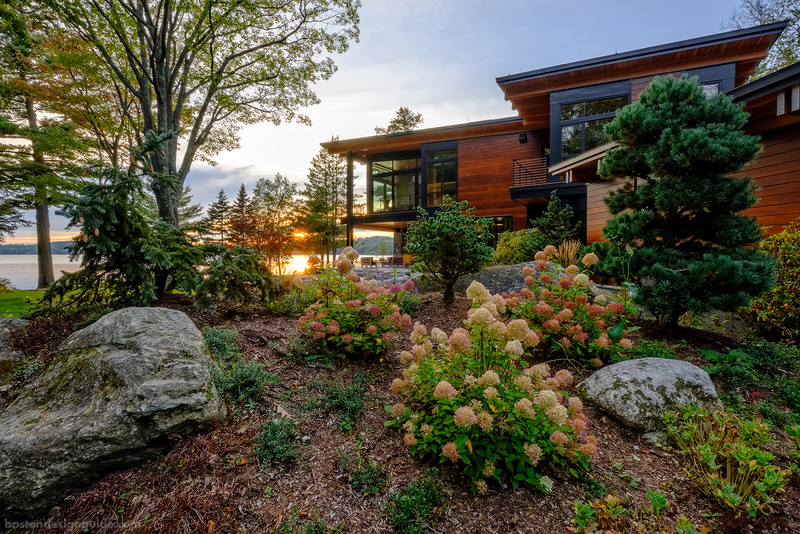 Pellettieri Associates, Inc. took a different approach when imagining a singular environment for a lakefront property, juxtaposing layered and naturalistic elements against the streamlined contours of a contemporary home. While the home’s granite terraces, walkways and steps have a linear design befitting the dwelling, the lawns and plantings, like shocks of fern and wind-swept grasses against the home itself, serve as natural foils, cultivated to “enhance the spectacular, native shoreline environment,” says President George Pellettieri. 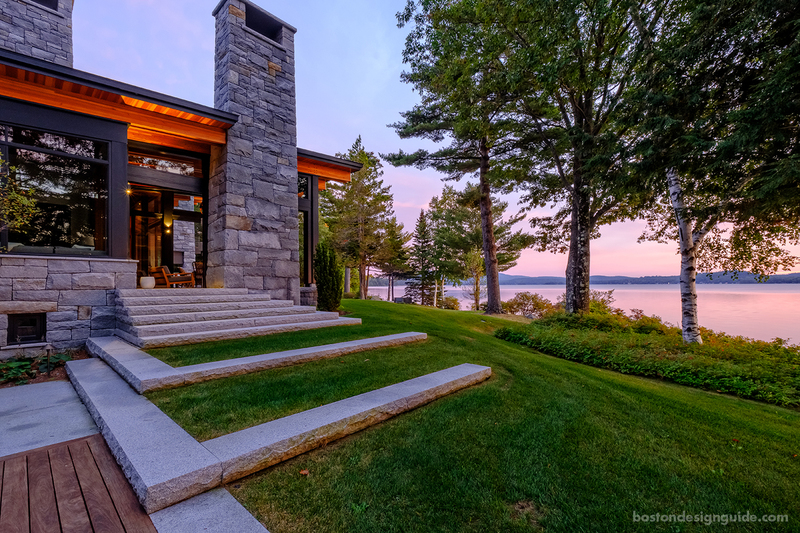 All of the outdoor spaces, layers of wood decking, stone, turf and vegetation, were designed with both function and aesthetics in mind, and created to have a strong connection to the interior of the home even as they look outward. 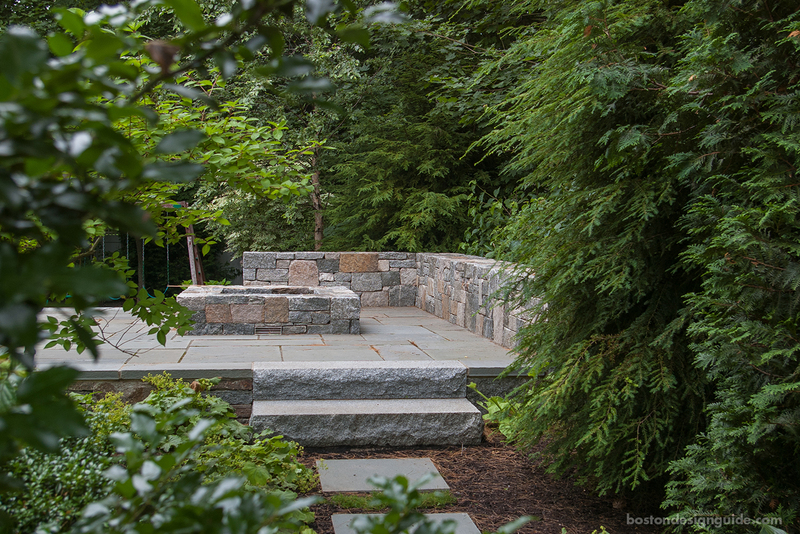 A Blade of Grass gave a Wellesley family the feel of a woodland escape in their suburban backyard. The arrival of a new addition for the home meant that the residents could rework their outdoor living spaces as well, so they enlisted the firm’s landscape designers to “reconfigure and enhance their backyard” with a program conceived for play and entertaining. A three-foot drop from the back door to the yard was the project’s main hurdle, but a Blade of Grass solved the issue by creating a bluestone patio punctuated by boxwoods, birch, astilbe, roses, magnolia and more that acts as a transition from the door to the grounds. The property now boasts a play area for the kids as well as a fire pit carved into the terrace surrounded by dense thickets of hemlock, holly and alchemilla. 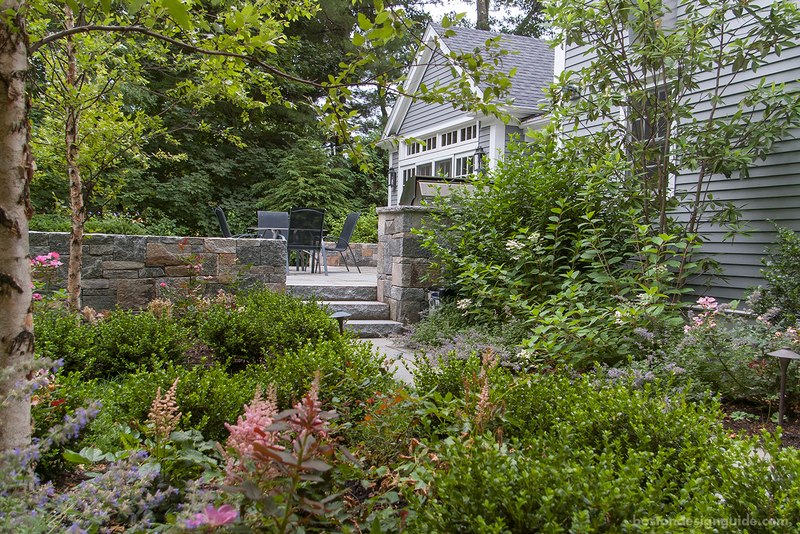 Thoughtful screening and stepping-stone pathways lined with hydrangea ‘quickfire,’ astilbe, arborvitae, holly, viburnum and Irish moss bring privacy and wonder to the outdoor spaces, creating a natural family respite that feels worlds away from the populated neighborhood. 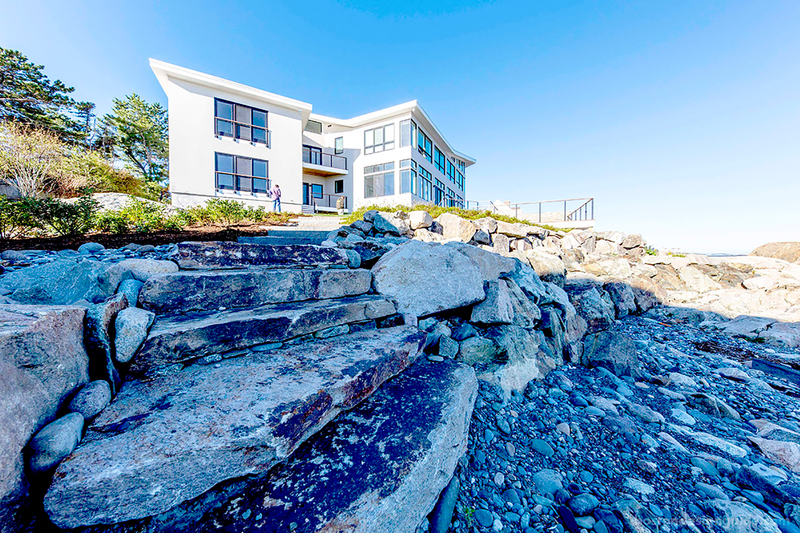 As the property curves toward the rocky shoreline, purple and green swaths of perennials guide the way, culminating by the water’s edge, where “water native” foliage like sweet fern, low bush blueberry, switchgrass and bayberry form a natural coastal buffer, and a stairway etched in stone leads the way to a kayak launch. 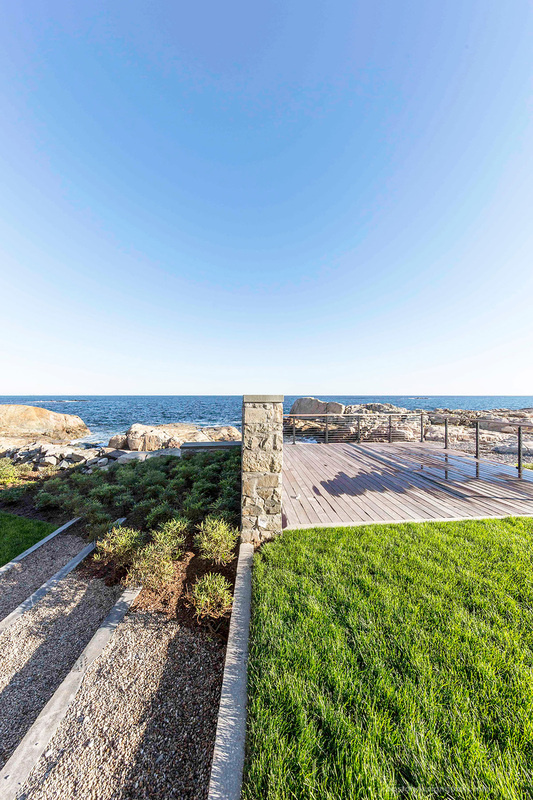 A low stone wall, partitioning a bed of plantings from a waterside deck area, provides a bit of shelter and directs the gaze out to sea. The platform is straightforward and in keeping with its site, with a railing that disappears into the landscape so as not to obstruct the site’s coastal beauty. PRO TIP: The addition of stone, steps and hardscape materials heightens the impact of foliage and flora, and grounds the more delicate plantings and trees. These static, natural elements are key when creating unspoiled edens. 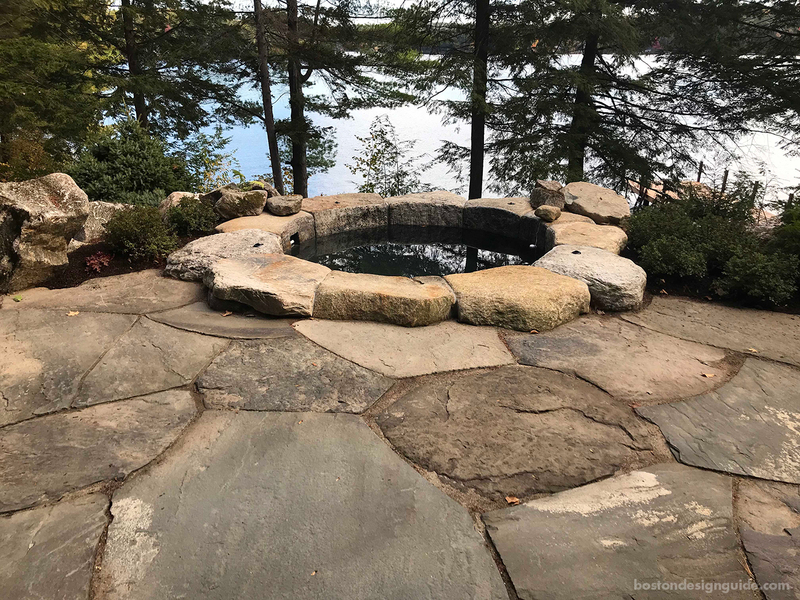 To create settings with a rustic beauty, use a variety of boulders within your hardscape, landscape or water feature, says Marketing Manager Derek Stearns of Plymouth Quarries, or incorporate live-edge stone slabs for steps and platforms for a “unique, free-style” look. For more information on achieving a rustic setting with stone, view Plymouth Quarries' video below. It was prepared expressly for Boston Design Guide. Enjoy!